Proper homemade marzipan gives this cake the edge over its shop-bought equivalents, but you can use ready-bought natural marzipan if you like. For the cake, beat together the butter, sugar, eggs, vanilla, flour and milk until smooth. Divide into 2. Use the tiniest dab of red food colouring to tint half the mixture pink. Spoon this into one side of the tin and spread level; fill the other side with the rest. Bake for 25–30 minutes. Cool for 5 minutes, then turn out onto a cooling rack. To assemble, lay one piece of cake on top of the other and trim to the same size. Cut in half lengthways to give 2 long strips of each colour. Warm the apricot jam and sieve. Lay a strip of pink cake on a board and brush the top and sides with jam; lay a plain strip next to it and do the same. Arrange the other 2 strips on top, colours reversed, and brush the jam all over. Roll the marzipan into a 20cm x 30 cm rectangle. 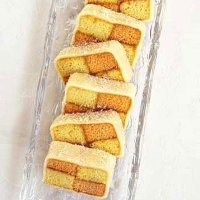 Place the cake at one end of the rectangle and tightly wrap in the marzipan, patching any holes. Sit on the seam, slice and serve.